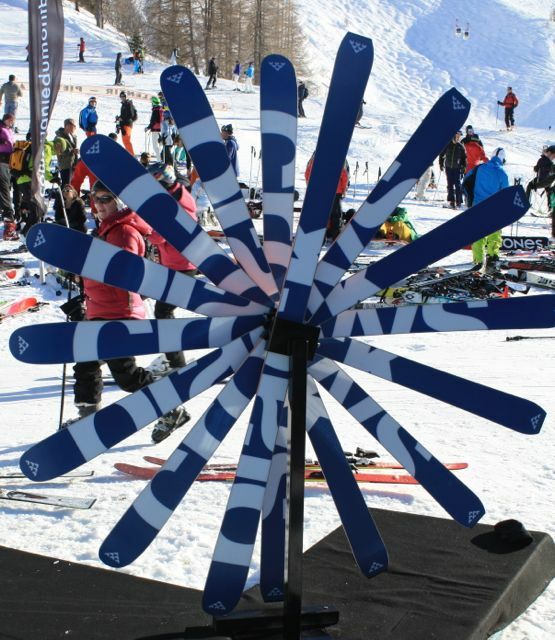 It might seem unlikely to many that a ski brand could host an edgy music festival, but there is no shadow of a doubt that Black Crows Skis’ The Black Weekend is the most directional and coolest event to happen in the mountains. 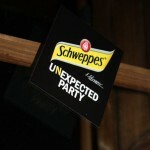 The festival evolved from a ski test day alongside the infamous Boss des Bosses competition with a DJ’s trance sound track, to a music-marketing tool for a niche brand of big mountain free-ride skis, conceived, designed and mostly skied-on in Chamonix, with a mantra of wild music and savage skiing. 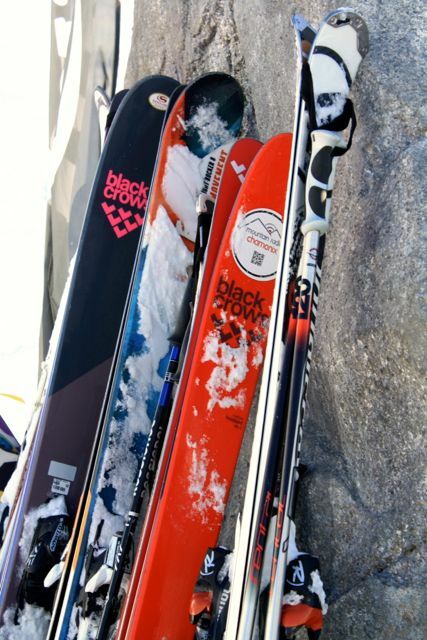 Launched in December 2006, Black Crows Skis were devised by local pro free-skiers Camille Jaccoux and Bruno Compagnet, who only wanted to make the best skis for the type of skiing they loved: high altitude, big mountain, back country free-riding. 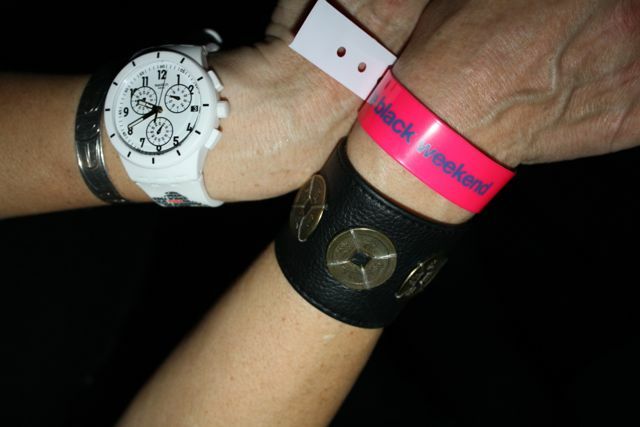 Both being utterly non-conformist and cutting edge, means their brand’s identity has been cool, dark and extremely clever, ever since they hatched Black Crows – a birdsong reflected perfectly by The Black Weekend. 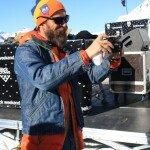 For its first 3 years the weekend saw a couple of hip Parisian DJs invited to Chamonix to play along with the local talent. 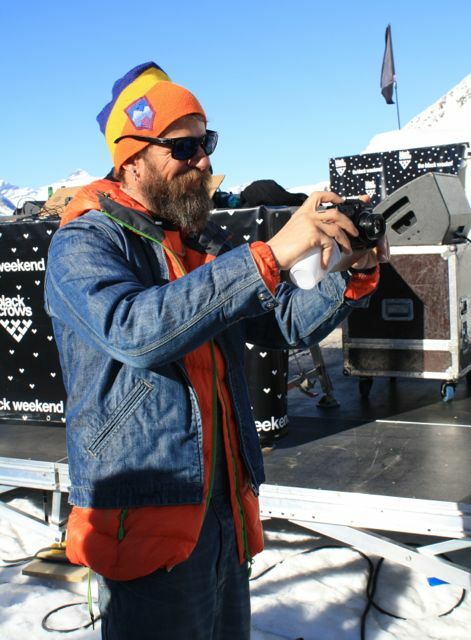 Sadly, 2010 was the year of the last Boss des Bosses moguls freestyle competition in Chamonix, but by then The Black Weekend had garnered a reputation for throwing some of the best parties in the Alps, with talked about DJs from Berlin, Ibiza and Paris spinning progressive house tunes. 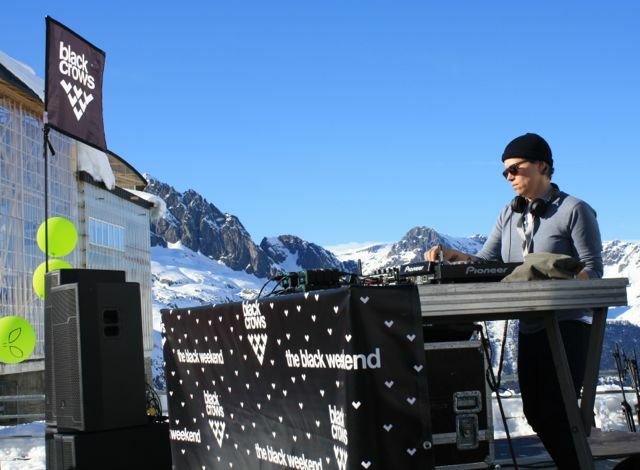 This year the black brand took things to a higher level than ever before with big name artists DJing from as close to the top of the Western world as you can get by public transport – the north deck of L’Aiguille du Midi, at 3842m of altitude in the Mont-Blanc massif – while still nodding to the wild skiing history of the event, by supporting The Hot Dog Day, a freestyle moguls race on a much smaller scale than the Boss des Bosses, but at which local hero, who always skied the Boss des Bosses, Glen Plake performed true to style. 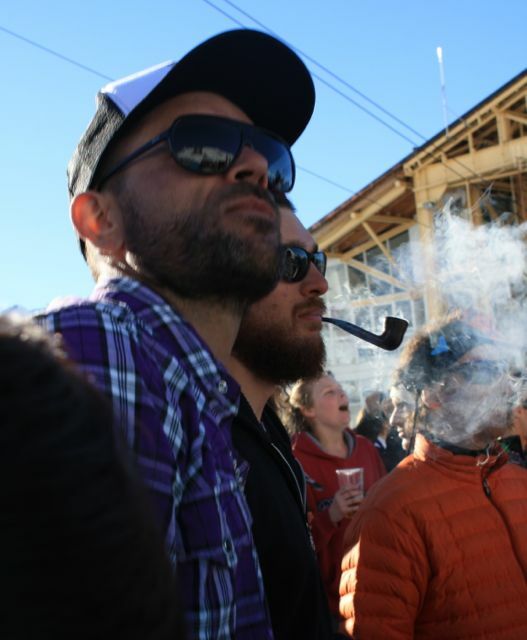 The festival opened on the Thursday evening to the tune of regular Black Weekend DJ Greg Boust warming up the chalet housing La Bergerie restaurant at the top of the Plan-Praz gondola on the slopes of Le Brévent mountain. 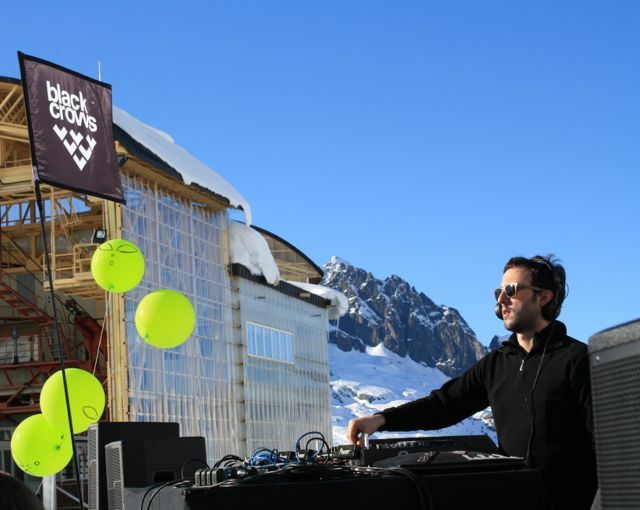 Berlin techno master Sascha Funke playing live with his wife Julienne Dessagne as Saschienne, hotted up the small wooden building at 2000m of altitude further. And then Italian Berliners Tale of Us, just blew the roof off with their set. 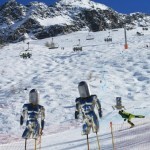 The wired crowd rode the especially late night running gondola down to the centre of Chamonix at midnight and piled into the chicest bar in town Les Caves to dance a second time to Sascha Funke DJing alone. Tale of Us soared for the skies the next day with a stunning set up at L’Aiguille du Midi, during which wing-suit pilots base jumped off the deck above them. Their daytime spectacle at altitude was followed by a bouncy first set from Agoria, who kicked off his high end one day tour of the Chamonix valley in style, flying from Mont-Blanc to play to the Crows’ nest at Lognan on Les Grands Montets after We Are Knights’ gig and then up to Montenvers to spin again with Kosme, before finishing his Black Weekend grand tour with a party at the Chamonix ice rink in town. The third day showed no slowing of pace, as Jennifer Cardini (a genius bit of booking on International Women’s Day) proceeded to keep skiers dancing after Rocky’s performance set them off at the Lognan nest in the afternoon; to then totally rip up the rule book of Chamonix clubbing with a banging late night set at a last minute rearranged venue. Jenny had been lined up to play out the biggest party night of the festival, originally set down valley in Les Houches with edgy electronica band Jabberwocky performing live and Ibiza heavy-weight Michael Mayer spinning techno. 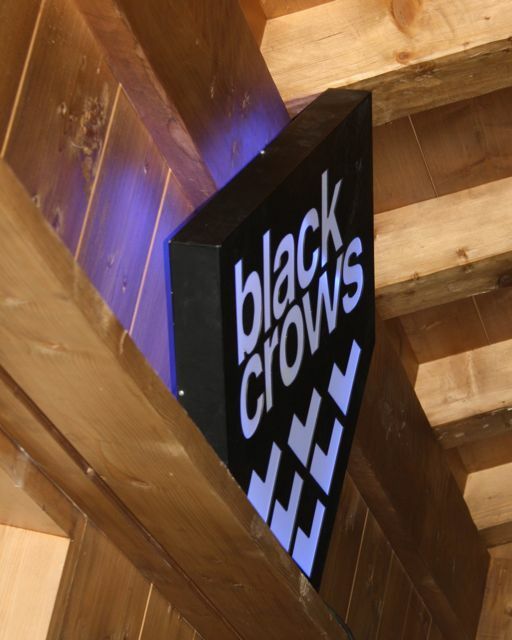 The majority of this huge night was relocated to La Lucarne, the bar at the Chamonix ice rink, apart from Jennifer Cardini’s inspired set for which the Black Crows and their flock of Chamonix clubbers trooped across town to the BackRoom of night spot Amnesia to enjoy. The final day saw a live gig from Hypnolove and the mighty Michael Mayer playing under the sun on the snow at Lognan, with locals screaming their extreme delight as a wing-suiter zoomed over the crowd. 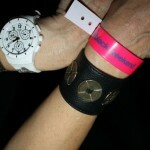 This show was followed with French electronic artist YoggyOne performing live and Berliners Dada Disco DJing at a pool party in the early evening, with a special surprise guest appearance by DJ Ricardo Villalobos at the final closing party in Les Caves, finishing off the weekend on a high and taking the standards of dance music played during it to dizzying heights. 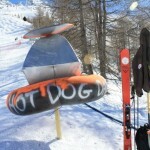 So, what of the skis and the skiing? 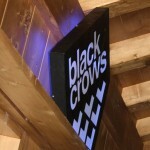 The Black Weekend’s core premise is to promote Black Crows Skis. 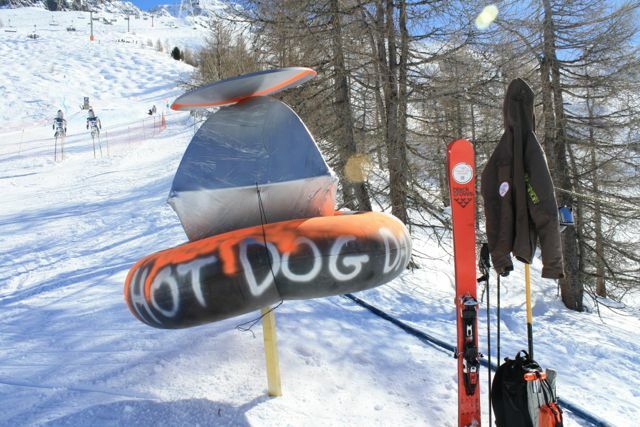 Throughout the weekend the full range of skis, including the newest, yet to be released models were available to test at Lognan Crows’ nest on Les Grands Montets. 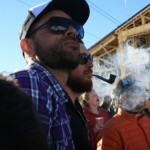 I confess I was somewhat seduced by trying out a pair of Viators at the 2012 Black Weekend. I was worried that as a high-end clubber in retirement, I had been swept away by hearing the techno and trance that I loved (of which not a huge amount is heard in Chamonix) while trying out skis on my favourite mountain above my village home; and this combined with the coolly persuasive marketing play on ornithological words had convinced me I wanted wings I could not fly. 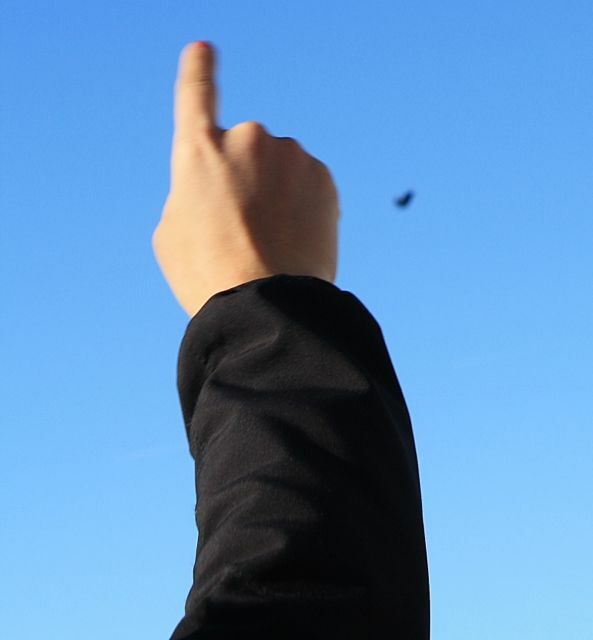 I actually ended up soaring around 12 months later for a pair of Camox Freebirds. 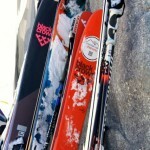 With these feathered friends in my ski quiver, my skiing immediately went up several notches. 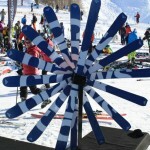 The Camox Freebird is an all-mountain touring ski – light, durable, responsive, reliable and, above all, extremely enjoyable to ride. My Freebirds are my go anywhere, particularly if it’s up high and off piste, ride anything skis, while the imagery and branding are an appropriate reflection of the wild, back-country, free-ride, combat skiing they handle so well. 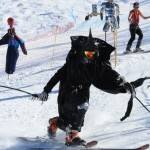 I can’t imagine skiing on anything else now – because once you go Black, there’s no going back. 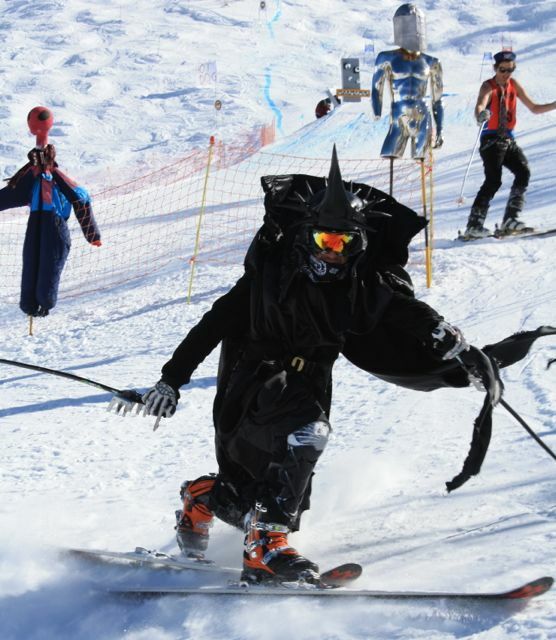 The complex logistics of a winter trancey music festival in a mountaineering resort did not stop its loyal fans from following every turn of events to make this year’s Black Weekend a huge success. 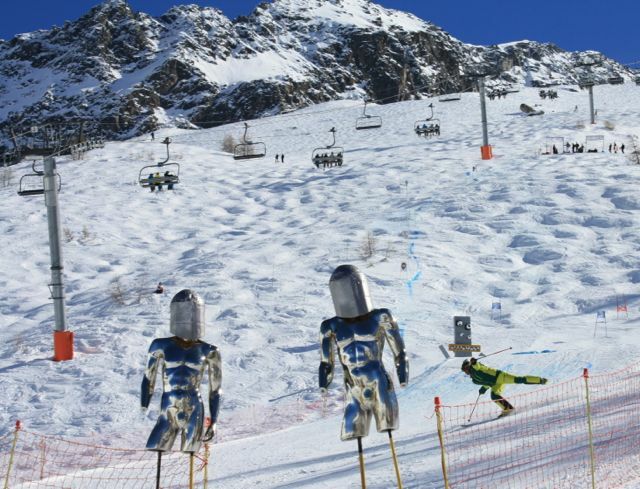 Few managed to see all four of the Agoria performances, as that involved racing from one long high mountain lift to another and finishing down town late after an extreme schedule. Last minute venue changes due to strict local licensing laws didn’t stop clubbing regulars and festival fledglings from packing out the parties, as the populace of Chamonix do everything to extreme, even clubbing, so were un-phased by having to make small journeys to enjoy their adventurous partying. The artists and DJs might be unknown to the mass market charting club scene, but by leading the edgy French electronica scene or being influential in Berlin and on Ibiza, they fit with the black ice cool of the Crows’ perfectly to set The Black Weekend ever at the leading edge of dance festivals, even if it seems hemmed in by the geography of its stunning location – it couldn’t be anywhere else, because Black Crows hatched out in Chamonix and birds might migrate, but always return home to nest.